According to Bachmann's catalogs, 1978 is the first year for this chrome plated example of the 85-foot Full-Dome, the retail was $9.00. The Auto-Train 85-foot Full-Dome Passenger Car is the first example shown in Bachmann's catalogs beginning in 1974. The car remains in the Bachmann catalog through the 1979 edition. Below you may click on the image of the Auto-Train train set and find more information regarding this offering that includes a pair of these passenger cars. 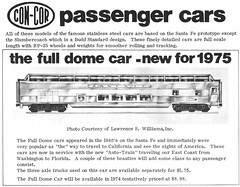 Bachmann's first HO-scale passenger car is this 85-foot Full Domed Passenger Car presented in the 1974 catalog. The Santa Fe roadname joins the Auto-Train and Amtrak listings in the 1974 catalog. 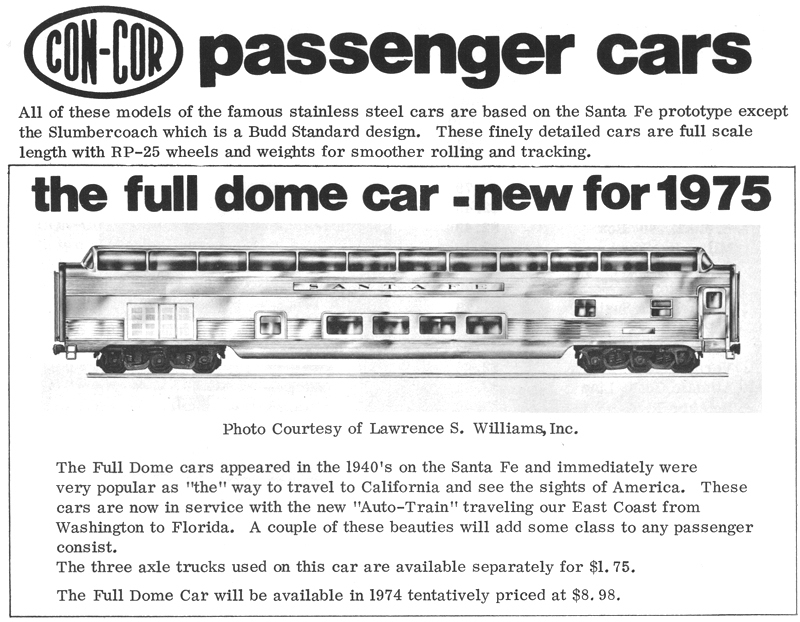 The Full Dome is priced at $10 in the 1974 Bachmann catalog. The 1978 catalog includes the description "Unlighted" for this car and the retail price is down to $8 for regular examples and $9 for chrome plated versions; however I see no suggestion in prior catalogs that the $10 examples of 1974-77 were lighted. To aid in navigating tight train set curves, Bachmann's design for the 85-foot Full Dome includes an interesting steering coupler. Illustrated above is an Auto-Train example showing the rod and arm assembly that makes the truck and coupler turn in unison. Con-Cor announced an HO-scale full dome passenger car for 1975 delivery. The car would have been the same prototype used by Bachmann's example that delivered around this same mid-'70s date. Con-Cor's model never materialized. You may click on the image above to view a larger version of this announcement.